Germany offers €1bn for solar power. A deal to fast track approvals for German companies in India and Euro 1 billion solar power fund by Germany were among major takeaways after talks between Prime Minister Narendra Modi and Chancellor Angela Merkel as both sides inked 18 MoUs to scale up ties in strategic areas. New Delhi : A deal to fast track approvals for German companies in India and Euro 1 billion solar power fund by Germany were among major takeaways after talks between Prime Minister Narendra Modi and Chancellor Angela Merkel as both sides inked 18 MoUs to scale up ties in strategic areas. Co-chairing the third summit-level Inter-Governmental Consultations, Modi and Merkel agreed to enhance ties in key areas of defence, security, intelligence, railways, trade and investment, clean energy, besides deciding to work closely to combat threat of terrorism. "We see Germany as a natural partner in achieving our vision of India's economic transformation. German strengths and India's priorities are aligned. "Our focus tends to be on economic ties. But, I believe that in a world of seamless challenges and opportunities, India and Germany can also be strong partners in advancing a more human, peaceful, just and sustainable future for the world," Modi said at a joint media event with Merkel after over three-hour-long talks, both at delegation-level and one-on-one format. The deal on fast-track approvals process for German firms envisages single point clearance for various projects which is aimed at encouraging more and more German companies to complement Modi's ‘Make in India’ initiative and invest significantly. The Prime Minister noted that the partnership will grow in in areas like "defence manufacturing, trade in advanced technology, intelligence, and countering terrorism and radicalism. These are important security dimensions of our expanding relationship." In the talks, Germany announced to provide assistance of over one billion euros for India's solar projects. The 18 pacts signed included a Joint Declaration of Intent between HRD ministry and the Federal Foreign Office of Germany on promotion of German as a foreign language in India and the promotion of Modern Indian Languages in Germany. The pact is seen as resolution of the sticky German language row. Both the leaders also discussed ways to move forward the stalled negotiations on the India-EU free trade agreement. Modi and Merkel shared their concerns about growing threat and global reach of terrorism and extremism and agreed to build closer collaboration to counter these challenges and decided to have meetings of the Joint Working Group on Counter Terrorism between the two sides. 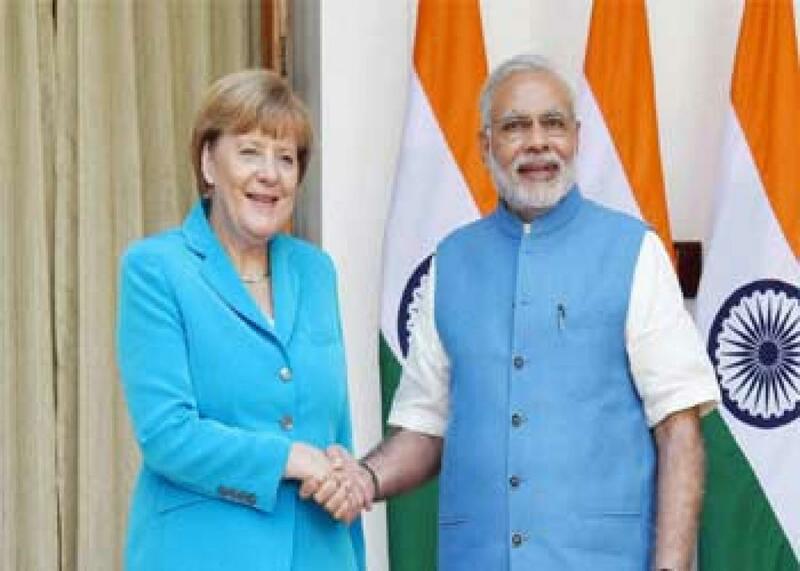 A joint statement said Germany welcomed India's intensified engagement with various export control regimes like the Nuclear Suppliers Group (NSG), the Missile Technology Control Regime (MTCR), Australia Group and the Wassenaar Arrangement. Both sides agreed to continue to work together for India's accession to the regimes as a full member and "thereby strengthen global non-proliferation efforts". The German side welcomed Modi's commitment to improve the ease of doing business in India and the Indian decision to set up a Fast Track System for German companies in the Department of Industrial Policy and Promotion (DIPP) which would be fully operationalised by March, 2016. The two sides renewed their determination to expand bilateral trade and investment significantly as they emphasised the need for opening markets for attracting investments. Expressing happiness over the broad range of outcomes, Modi said, "We can look forward with confidence to increased investment, trade and technology partnerships in manufacturing, infrastructure and skill development. "He said German engineering and Indian IT skills can create the next generation industry that will be more efficient, economical and environment friendly. "1600 German companies in India, and growing in number, will be strong partners in creating a global work force in India," he said, adding German cooperation and assistance in areas like smart cities, clean Ganga and waste management projects have taken a concrete shape. In her comments, Merkel expressed satisfaction over outcome of the talks and complimented Modi for the "speed" in which he is pushing various initiatives. She also listed various initiatives by the two countries including in the fields of defence, security, trade and investment and solar energy.